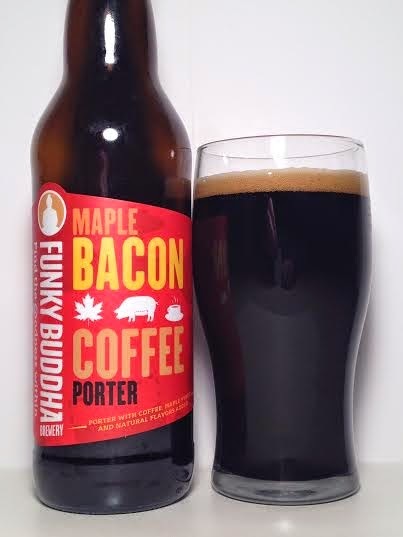 Once a year Funky Buddha Brewery (another on my hit list) has a special release for one of their most highly acclaimed beers. This past month they had the MBCP Fest which was an all day event featuring music, food, and close to 50 different beers on draught. Those lucky enough to be there got their share of MBCP. I wasn't there, but I was able to work out some trades using my persistence, charm, and rugged good looks. Pours pitch black with a miniscule amount of ruby red on the edges if I hold it up to the light. Got a finger of a tan head that disappeared quickly. The first sniff is all coffee. Rich, roasted coffee. When I inhale deep, it's a blast of sugary maple syrup. I wouldn't call the malts roasted, but it has a smokey smell which is even a little bit salty. There's a nice chocolatey taste initially, but it comes with the aforementioned salt. Behind that is even a hint of toffee. There's not a whole lot in terms of actual bacon, but the "B" in MBCP is represented by smokiness and salt. The coffee is pretty subdued on the taste, but the maple syrup is here all throughout from start to finish, especially the finish, where it lingers for a few joyous seconds. At first the salt was a bit overpowering, but as the beer warmed up, maple syrup became more prominent and helped take away some of the saltiness. There's no carbonation to speak of which makes it feel like flat Pepsi. While not as heavy as expected, it does spread flavor all over the tongue and feels just like a 6.40% porter should. Maple lingers in a pleasant way and after each sip, this finishes sticky and sweet much like fresh maple syrup. Maple Bacon Coffee Porter was almost held back by some overpowering saltiness, but luckily maple syrup and some chocolate swooped in to balance that out. The coffee was stronger on the aroma than on the taste, but most of us will come into MBCP wanting maple syrup. If that's your thing, then this delivers big. This beer is salty, sweet, sticky (I know what you're thinking) and is reminiscent of a morning breakfast. A great dessert beer, and if socially acceptable, a great breakfast beer.